Time to plant trees in the garden, these are bare roots I potted late spring. If you have been fertilizing, it is time to stop. 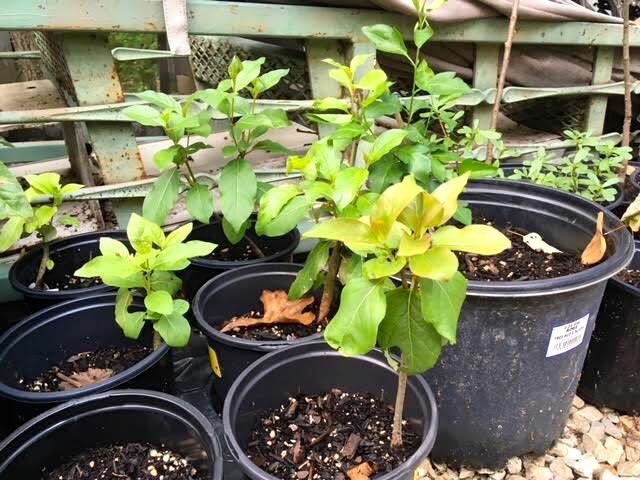 Plants need to start slowing down and get out of the growth they usually pursue through spring and summer, even without the boost of fertilizers. Add a last dollop of compost mixed in the soil and that should be it for this season. Do keep watering trees and shrubs from now through hard frost. Our first hard frost is usually mid to end of October. Start cleaning up flowerbeds and vegetable gardens by removing spent plants and saving seeds. Leave the ragweed to treat the soil, they will die once their work is done. If you plan to start a new garden next year, this is the time to cover it with cardboard to kill off any current growth. Bring some of your herbs inside including parsley, chives, rosemary , catnip and stevia. Basil can also be brought inside; sow seeds now to get new plants started for later use. Dry the herbs and store in airtight container. Good time to move peonies. I have several I buried the eyes too deep so when replanting, remember to not bury any more than an inch or two beneath the soil surface. Daylilies and iris can also be dug up and divided. Make notes in your garden diary about to dos for next year. Note what plants worked well this year, what seeds you had meant to plant but didn’t get to – whatever you want to tackle next year. Have favorite annuals? I do, too, and I trim them now before bringing them inside. You can also take root cuttings and start young plants if you have good indoor light. Geraniums, coleus, wax begonias, impatiens all will winter over inside if you keep them pinched and bushy. Geraniums will winter over stored in brown bags without soil. Order spring bulbs. Daffodils are toxic to deer so they won’t get munched on. Tulips are not so buy a few for color, then plant them behind a solid wall with wire if you don’t want wildlife snacking on them in the meantime. If you have left over Amaryllis bulbs, put them in a dry, dark place without water and let them rest for a couple of months. If you want to time when they bloom, pot and water them 6 weeks prior to when you want them in bloom. My deck is starting to get covered in leaves so I am sweeping them off to the composter and getting those emptied onto the flowerbeds. Don’t bag and rake clippings, leave them on your lawn to return Nitrogen to the soil. This is also a good time to stock up on mulch. Buy it in bulk or load up at your local recycling center before they close down for the season. Start trimming plants you plan to bring inside to overwinter. It's almost fall! Plant new flower beds with a cover crop to keep the soil well conditioned. 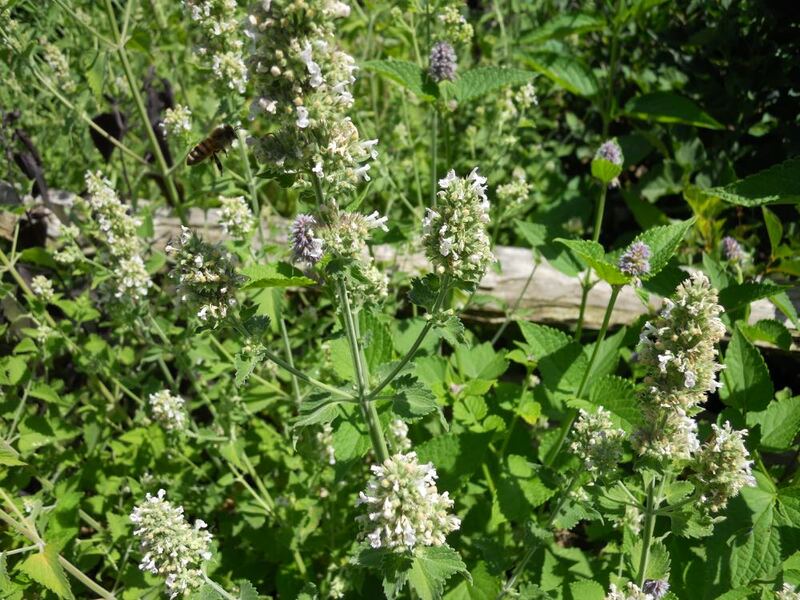 Buckwheat grows fast, has a lovely white flower and can easily be mulched. It is also a good fall pollen source for bees. Where has the time gone? It’s almost fall, another season, time to start getting the garden ready for winter. Do keep watering trees and shrubs from now through hard frost. In USDA Zone 5b, our first hard frost is usually mid to end of October. Start cleaning up flower beds and vegetable gardens by removing spent plants and saving seeds. Leave the ragweed to treat the soil, they will die once their work is done. If you plan to start a new garden next year, do the soil preparation now so the area will be ready for any planting you are planning to do early next spring. For later use, plan on bringing some of your herbs inside include parsley, chives, rosemary and stevia. Basil can also be brought inside; sow seeds now to get new plants started for later use. Good time to move peonies. I have several I buried the eyes too deep so when replanting, remember to not bury any more than an inch or two beneath the soil surface. Daylilies and iris can also be dug up and divided now. Start trimming plants you plan to bring inside to overwinter. My deck is starting to get covered in leaves so I am sweeping them off to the composter and getting those emptied onto the flower beds. Don’t bag and rake clippings, leave them on your lawn to return Nitrogen to the soil.